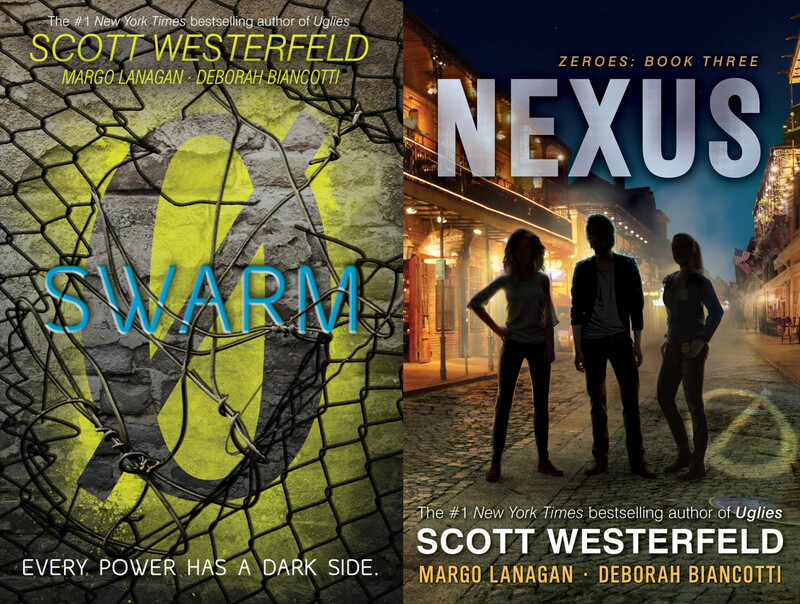 In 2015, Scott Westerfeld, Margo Lanagan and Deborah Biancotti published Zeroes, a wonderful, intricately plotted YA thriller about the discovery by a group of teens (all born in the year 2000) that they have a variety of extremely millennial supernatural powers, which grow in strength in social situations; in the years since, the authors have finished the trilogy with two more excellent volumes: 2016's Swarm, which introduces out-of-town powered teens and raises the stakes to life or death for the Zeroes' whole hometown; and 2018's Nexus, which sends the Zeroes off into conflict with the US government, and a massive army of not-exactly-but-sorta-evil powered teens who have all the crowd magic of Mardi Gras to work with, in a battle over the fate of the human race itself. Considered as a trilogy, the Zeroes books are practically perfect, with an opening volume that turns on the intensely personal stakes of a cast of characters whom we come to love and fear for, as their flaws and strengths are highlighted. Book two puts the characters in conflict with the wider world, hinting that the action in Book One was a microcosm for a much bigger story that's being repeated all around the world -- while Book Three puts the whole world in play, raising and raising the stakes until there's no headroom at all, finishing in a glorious setpiece in a fantastic location with a cast of thousands and incredible action, pulse-pounding suspense, true love, battles between good and evil, impossible choices, and an ending that will stay with you for days after. The Zeroes' powers are likewise perfect for spinning up little allegorical scenes that resonate with our contemporary world: Crash is an electrosensitive whose nerves are frayed raw by the electromagnetic energy emitted by the devices around her; she can reach into those devices with her power and crash them, or fix them. The more electronics she crashes, the more powerful she becomes. Bellwether can convince anyone of anything, commanding their attention and respect, but only when the crowd is big enough. Mob can sense and amp or damp the mood of any crowd: she's the world's greatest DJ, but when she's scared or angry, she can throw the people around her into a panic. Flicker was born blind, but she can sightcast, looking through the eyes of the people around her. And Anonymous disappears from the attention and memories of the people around him -- he nearly died when his parents brought him to the hospital for a tonsilectomy as a small child and everyone, his parents, the nurses, the doctors, simply forgot about him. He's been fending for himself ever since. As the Zeroes encouter more powered teens with a wider array of powers, the true nature of the powers comes into focus, making for a wonderful technothriller with prison-breaks and car-chases and mob warfare. Their adolescent fury and passion makes them the perfect protagonists for this story, and the authors make such wonderful use of the scenario they've set up. Highly recommended -- the book says 14 and up, but I'm sure there are precocious 11 or 12 year olds who'd love these.